« New Leopard Shell Waterproof Liquid Eye Liner Eyeliner Pen $1.97 SHIPPED! 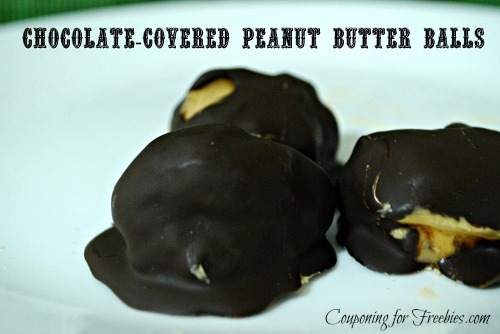 I have seen people making various chocolate-covered peanut butter ball recipes, but they all used cream cheese, one item on the very long list of foods I don’t eat. So, I figured that would just be one yummy treat I wouldn’t get to enjoy. Until, I found a substitute! And, you’ll never guess how simple it is: butter! That’s it! I was SUPER excited to finally make a batch of these up and, boy, are they good! If you’ve been craving these yourself but don’t eat cream cheese either, this one is for you! Note: When I use tablespoon in this recipe, I mean the large table spoons. Teaspoon is the smaller spoons you would use for desserts. These are not the equivalent of measuring spoons. 1. Mix 3 tablespoons of peanut butter with 2-3 teaspoons of butter until smooth. You can add or subtract from this as much as you want. I made a small batch so that we wouldn’t be tempted to eat so many! Use your mixer for this step – it’s MUCH easier than trying to hand mix it. 2. Add in your confectioner’s sugar. I didn’t measure this out. Just add it until you get a course dough consistency. 3. Roll your mixture into balls and put onto wax paper-covered cookie sheet. They probably won’t be perfectly round at this stage (mine weren’t), and that’s OK. Just get the basic shape. 4. Stick cookie sheet in refrigerator to chill for about an hour. 5. Round your peanut butter balls out and stick back in the refrigerator for another 30-60 minutes to make sure they’re nice and firm. 6. Melt your Baker’s chocolate in the microwave according to package directions. 7. Stick your peanut butter balls in the Baker’s chocolate, cover completely and put back onto cookie sheet. 8. Chill peanut butter balls in refrigerator for at least 1 hour. I know it looks like a lot of steps, but making these really is VERY easy! Here’s a tip for you: make sure you get sweetened Baker’s chocolate. We picked up unsweetened because that was all my store had left, and it really had a bit of a bitter taste. Like this recipe? If you try it out, make sure you come back and let us know how you liked it!